(i) High Precision and Repeatability. Accuracy or precision is the ability of a machine to produce desired dimensions. Repeatability is the ability to produce the same part for the same dimensions every time. Accuracy of a machine depends mainly on its control resolution which is the minimum distance between two points which the machine can differentiate. Repeatability is affected by mechanical errors such as backlash in the machine. The ability of Machine Control Unit (MCU) to differentiate between closely spaced points is a function of factors such as the controller's bit storage capacity, drive motor and the type of feedback sensor. Illustration of High Precision and Repeatability figure below illustrates accuracy and repeatability as a function of control resolution and mechanical errors. (ii) Reliability. It depends on the speed and load during operation as well as on the quality of the machine structure and control system. (iii) Efficiency. The machine structure should be such that it should support all the machining operation stresses and strains with the capability of performing all type of operations in specified time. Note. To meet these requirements in CNC machine tools slide ways, the techniques used include hydrostatic slide ways linear bearings with balls, rollers or needles and surface coatings. (c) Spindle Mounting. In CNC machines, large variation in cutting speed is required. The cutting speed may vary from 10 metres per minute to 1000 meters per minute or more. 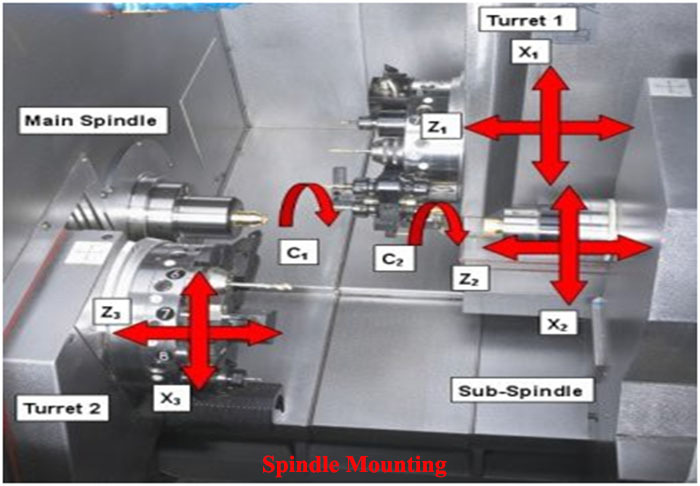 The cutting speeds are provided by rotation of the main spindle with the help of an electrical motor. The infinitely variable speed system used in CNC machines are employed with either electric motors (A.C. or D.C.) or fluid motors. (d) Drive Units. Drive motors are required to drive the main spindle (Spindle drive) and to drive the saddles or carriage (Axis drive). In addition there may be some motors in CNC machine for services such as coolant pumps, swarf removal, etc. (ii) Allow manual or semi-manual control machine tool elements. (iii) Enable machine tool to be programmed. (g) Swarf removal. CNC machines are designed to work at optimum cutting condition with the improved cutting tools on a continuous operation basis. Since the cutting time is much more in CNC machines, the volume of swarf generated is also more. Unless the swarf is quickly and efficiently removed from the cutting zone, it can affect the cutting process and the quality of the finished product. Also the swarf cannot be allowed to accumulate at the machine tool because it may hamper the access to the machine tool. In addition some auxiliary functions like automatic component loading or automatic tool change may also be affected by accumulation of swarf. To avoid these problems, an efficient swarf control system should be provided with the CNC machine tools with some mechanism to remove the swarf from the cutter and cutting zone and for the disposal of swarf from the machine tool area itself. (h) Safety of operator: Safety of operator is very important aspect which cannot be overlooked. To ensure safe working conditions the CNC machine tools are provided with metallic or plastic guards. Where it is not possible to provide effective guards, proximity protection is provided by perimeter guards, pressure mats or light barriers.